To test the efficacy on reproductive performance of nutritional supplementation in an out-of-season mating system, 66 adult prolific Barbarine ewes were selected and induced to breed using “ram effect”. The ewes were allocated to two homogeneous groups; each ewe received on a daily basis 700 g of hay and 500 g of barley grains starting 3 weeks before or 1 week after rams’ introduction in group 1 and group 2, respectively. Supplementation ended 1 month after rams’ introduction and mating lasted 60 days. Final live weight 30 days after introduction of rams was higher (P < 0.05) for ewes in group1 (39.45 vs. 36.72 kg). Seven days after introduction of rams, ewes in group 1 recorded higher plasma glucose levels than females in group 2 (4.12 and 3.9 S.E.M. 0.05 mmol l−1). Proportions of ewes which displayed estrus between days 16 and 26 were 48 and 38% in group 1 and group 2, respectively (P < 0.05), and those which had a normal induced cycle (16–17 days) were 25 and 11% in group 1 and group 2, respectively (P < 0.05). Fertilities were higher (P < 0.05) for ewes in group 1 than in group 2 (91.17 vs. 75.75% and 97.1 vs. 81.8% for fertility at induced estrus and total fertility, respectively). It is concluded that a timed supplementation starting 3 weeks before introduction of rams is effective in yielding high reproductive performance for the prolific strain of the Barbarine breed. 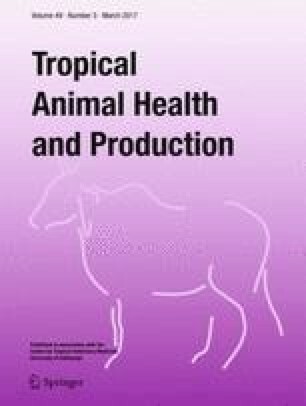 Ethical concerns were taken into account by adhering to local animal welfare regulations and practices and conformed to ethical guidelines for animal usage in research of the National Institute of Agricultural Research in Tunisia (INRAT, Tunisia) and the Association Tunisienne des Sciences des Animaux de Laboratoire (ATSAL, Tunisia).